A description of our equipment and the custom made software that we use for control and monitoring purposes. All measurements are performed using three fully equipped Chroma stations. The first two Chroma stations can deliver more than 4 kW of load and consist of two 63601-5 and one 63600-2 mainframes each. The aforementioned mainframes host twenty 63640-80-80 [400 W] electronic loads in total along with a two 63610-80-20 [100 W x2] modules. The third Chroma station is able to deliver up to 2500 W of load and consists of two 6314A mainframes equipped with the following electronic loads: six 63123A [350 W each], one 63102A [100 W x2], and one 63101A [200 W]. The AC sources that we use are a Chroma 6530, capable of delivering up to 3 kW of power, a Chroma 61604 with 2 kW max capacity and a Keysight AC6804B with 4 kW max power. All AC sources are connected to the mains network through two powerful isolation transformers and for the 6530 we also use a CyberPower OLS3000E online UPS while the Keysight source is protected by an FSP Champ online UPS with 3 kW capacity. Our electronic loads collection also includes ten Array units (seven Array 3711A and three Array 3710A) and two Fast Auto FA-828ATE. We use the following oscilloscopes: a Keysight DSOX3024A, a Rigol DS2072A, two Picoscopes 4444 and two Picoscopes 3424. We also have at our disposal three more oscilloscopes: Rigol DS1074Z, Rigol VS5042 and a Stingray DS1M12. 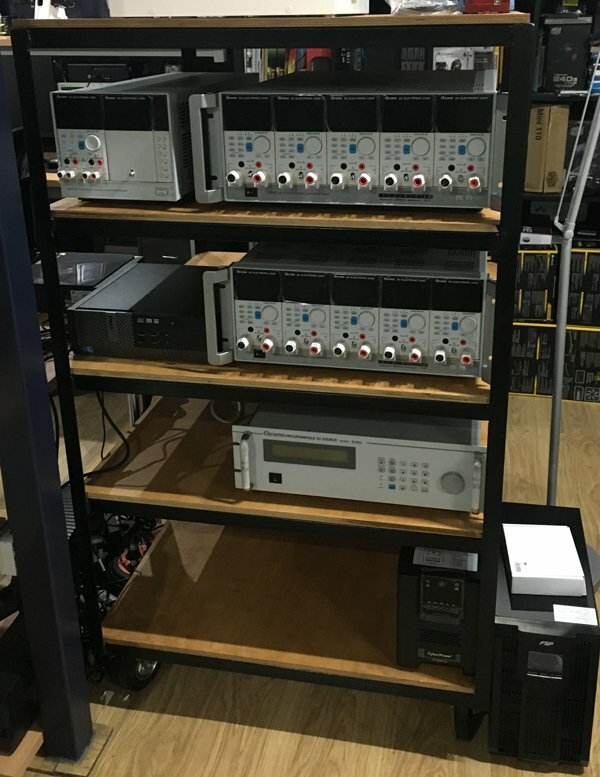 The rest of our equipment consists of two Picotech TC-08 thermocouple data loggers, two Fluke multimeters (models 289 and 175), a Keysight U1273AX multimeter, a Keithley 2015 THD 6.5 digit bench DMM, and two lab grade N4L PPA1530 3-phase power analyzers, featuring 0.05% basic accuracy. For back-up purposes we have a Yokogawa WT210 power analyzer and a GW Instek GPM-8212. Finally we also have a highly accurate N4L PPA5530 3-phase power analyzyzer with 0.01% basic accuracy. The noise measurements are conducted with a Class 1 Bruel & Kjaer 2250-L G4 Sound Analyzer, equipped with a type 4955-A low-noise and free-field microphone which can measure down to 5 dB(A) (we also have a type 4189 microphone that features a 16.6-140 dBA-weighted dynamic range). 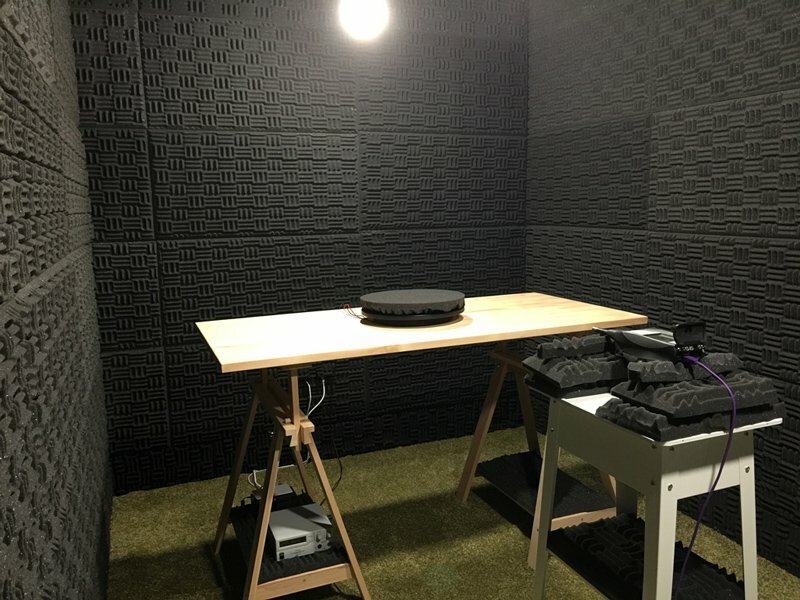 The sound analyzer is installed into a hemi-anechoic chamber which allows for lower than 6 dB(A) ambient noise. A Bruel & Kjaer Type 4231 is used before every noise measurement, to calibrate the sound analyzer. We are able to conduct Electromagnetic Compatibility (EMC) evaluations since our lab is equipped with a Rigol DSA815-TG Spectrum Analyzer (9kHz -1.5GHz), featuring the EMI option. We also use a Tekbox TBLC08 LISN to isolate the power mains from the device in this test (DUT). Our second Spectrum Analyzer is a Signal Hound BB60C. To identify the EMI source should the need arise, we have at our disposal a set of Tekbox EMC probes (TBPS01) and a TBWA2 wide-band amplifier. We conduct all of our tests at above 30 °C ambient to simulate the environment seen inside a typical system more accurately. For this purpose we use a custom made chamber, equipped with heating elements which are controlled through software and are able to set automatically the desired temperature inside the chamber. What provides us with an edge over all the rest labs is the custom-made software, used for controlling all of our equipment, from the electronic loads and the power analyzer to the temperature logger and the electromagnetic relays that control the heat inside the thermal chamber. The development process of this piece of software never stops since we constantly enrich it with new features. The first version of the Faganas ATE software was released in the early 2010. With over 22,000 lines of code, excluding the libraries, the Faganas ATE test suite allows us to test a PSU in any way we want, providing increased usability and high accuracy in the test results, thanks to the sophisticated algorithms and routines that handle the data outputs of all of our equipment.